I feel things–though I am not sure if it is good or not. 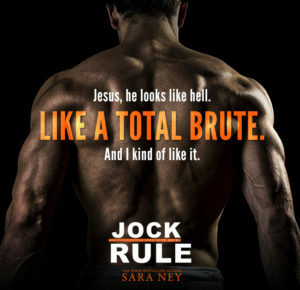 Jock Rule is the second installment in Jock Hard series by Sara Ney. A standalone contemporary romance that surrounds Teddy a girl who is constantly taken advantage of by her friends, and Kip aka Sasquatch–a loner who prefers to keep things at arm’s length at all times. However, when Kip offers Teddy his services to help her catch another males eye and finally move out of the shadow of her friends, they both soon realize how much they needed the other. I’ve been pushing off writing this review because I honestly don’t really know what to say. I enjoyed reading this installment–don’t get me wrong, but I felt throughout my time reading that something felt off. Going in I knew that more likely than not there would not be any conflict or drama in this book; solely because the first book in the series (Jock Row) had the same concept of being a feel good story. So I went into this with the mentality of “this book will be the NA Hallmark” and that helped my reading experience immensely compared to when I read the first. However, I felt like the characters didn’t really have any depth to them–it was all one note and the scenes felt monotonous and at some points even the dialogue between the two main characters felt off and unrealistic, which drew me out of the world a few times. I felt more of a connection towards Kip than I did with Teddy, which for me is odd with a Sara Ney novel because it is usually the other way around. But with this one I could not for the life of me stand Teddy. Her constant mood swings, and outbursts over ridiculous things annoyed the ever-living day lights out of me. I did however like the banter between both Kip and Teddy when it felt real. I liked how Teddy nor Kip judged each other for their upbringing and instead took to each other because of who the other person was on the inside rather than their parentage. Also Veronica, Kip’s sister, LITERALLY SAVED THE ENTIRE BOOK. I swear I love her so much, and who not mind a book solely dedicated to her. It would be a time. Overall, I gave this book 2 stars, because like I said it felt different. Will I be picking this book up to read again? In all honesty–probably not. Did I enjoy my time while reading it? Yes, I did. I just really feel like the book didn’t feel like Sara Ney, but rather a different person. I’m not sure if that is a good or bad thing, but I’ll still be here to see what’s next from her. ARC provided by Inksplinger PR in exchange for my honest review. Quotations taken from an uncorrected proof and may change upon final publication. Promotional graphics and teasers provided by Inksplinger PR.